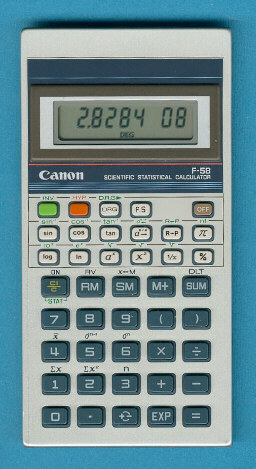 Size: 5.6" x 2.8" x 0.4"
The Canon F-58 Scientific Statistical Calculator traces back to the Texas Instruments TI-31 Solar. If we run the Calculator Forensics on the F-58 we discover the same 11-digit precision found on the TI-31 Solar family. If you compare the two calculators you will notice totally different features, keyboard layout and even number of keys. This gives you a rough approach of the flexibility designed into the Toshiba calculator chips. The internal construction of the F-58, based on the LX-40 calculator, is very sophisticated. Just a small, one-sided printed circuit board (PCB) attached to the LC-display, battery and the keyboard. The keyboard itself uses a sandwich of two conductive foils with an isolating spacer between them. The sheet metal supports the connections of the PCB to the LC-display and the keyboard. The FS-51 used the same calculator circuit with solar-cells instead the batteries, the F-42 misses the statistical functions. Don't miss the odd F-56 introduced in 1981. © Joerg Woerner, September 27, 2002. No reprints without written permission.